Drawing cards in red has always come with some kind of a drawback. While blue gets card after card that just let it draw more cards, red always has to pay a price. Wheel of Fortune and the cards of its ilk would let you draw cards, but you had to discard your hand and everyone else in the game would do the same. Browbeat was a fun card if you were looking to deal 5 damage to a random opponent or, on the very rare occasion, draw three cards. Blue gets to "loot," named after Merfolk Looter, which allows you to draw a card, then discard a card from your hand. Red gets to "rummage," which forces you to discard a card, then draw a card. Not nearly as good as looting, since you may be discarding a better card than you are getting. In the end, red's card draw always seems to have a drawback. In spite of the drawbacks, people continue to choose to draw cards. It is just that good and that important. My preview card offers red another way to draw cards, with an interesting drawback not seen before for card drawing. The drawback gives this preview card very different value for one-on-one games as opposed to multiplayer. It demands a certain amount of creativity when deciding if it is worth the slot in your deck. Most importantly, it answers the age-old question: what is better than drawing a card? At first blush, Humble Defector is a relatively straightforward card. Pay two mana for a 2/1 creature that you can tap on your turn to draw two cards, then give it to an opponent. I like to look at the limitations on a card before examining the options. Others might say I focus on the negative; I prefer to call it being pragmatic. Better to know the limitations first, then try to exploit them. 1. This is a small creature. A 2/1 creature that offers no protection from X, isn't indestructible, and doesn't regenerate is killed by practically anything. It will die in combat almost every time. The smallest direct damage spell eliminates it. Even an effect that returns it to your hand costs you the chance of tapping it to draw two cards. 2. It is slow. Your opponent will see this coming from a mile away. Most red decks like to be doing something far more interesting than playing a wimpy creature that you won't attack or block with in the coming turns. It doesn't have haste, so after you play it, you won't get to use the "draw two cards" ability until it has been in play for a full turn. This can seem like forever in a multiplayer game. 3. You can only use it on your turn. You can't block, then use its ability to draw two cards. You can't respond to opponents destroying it on their turns. You can't attack with it, then tap it to draw two cards. When your turn ends, Humble Defector sits tapped, dangerously exposed. If you intend to use it to draw cards (and why wouldn't you?) it offers none of the benefits of having a creature in play, but all of the negatives of being a creature. 4. After you draw two cards, YOU HAVE TO GIVE IT AWAY! All the rest of the limitations are minor. You can figure out a way around them or live with them, but giving the creature to an opponent who will then get to use it on his or her turn? I understand that you can make cards that appear "balanced" work for you, but this card screams out that you should be the only one to get the advantage. Yet, if you have only one opponent, where is the card advantage? You get to draw two cards, then on your opponent's turn, he or she will get to draw two cards, unless you opt to destroy what would be your own creature. The benefit of drawing cards is that it tends to put you in a better position than your opponent. If you are both drawing cards, you aren't really in a better position. So what can we do to limit the downsides? Many of my casual games involve multiple opponents. Humble Defector lets me choose which opponent gets to have this card-drawing boon! This opens up a variety of possibilities. Is there an opponent who would likely destroy it? Perhaps you can make it clear that if Humble Defector lives, it will head that opponent's way? The game may be in a situation where you want to work with at least one of your opponents. This may create a situation where you and that player pass the Humble Defector back and forth, each getting two more cards with no downside! In larger games, it shouldn't be too hard to find one other player who is willing to pass Humble Defector back and forth with you. Admittedly, one of your opponents is getting the same benefit you are, but all of the others are not. If you choose to go the route of the Double Agent, understand the possibility of a double cross is always there. Once your opponent controls Humble Defector, he or she doesn't have to give it back to you. Someone may decide that all the card drawing is just too dangerous and choose to attack or block with Humble Defector in an attempt to get rid of it. Your opponent may get a better offer from someone else. You'll just have to know your opponents and take your chances. The Humble Defector is not to be trusted. You know he will defect when he gets the chance. Generally, you aren't all that interested in sending him off to an opponent, particularly when you have no idea where the Defector will go next. Often, the best plan is to simply get your two cards and eliminate the Defector. Whether you are looking at direct damage or some other means of eliminating the Defector, you've solved your problem. Linvala, Keeper of Silence is an interesting alternative to straight death. 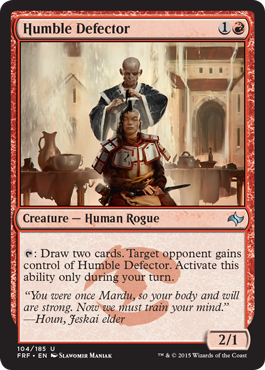 Rather than destroy the creature, just make it so the Humble Defector is nothing more than a 2/1 for your opponents. While this earns you style points, Linvala will earn you some serious wrath. People don't like to have the activated abilities on their creatures stopped. Once your opponents get rid of Linvala, one of them will control a Humble Defector that can give him or her two cards. I doubt that your opponent who just drew two cards is going to be interested in returning the Defector to you. I don't like either of these options, as I believe you are limiting your gains. You are spending a card on the Defector, then another to eliminate it, to draw two cards. All you have done is replace two cards with two other cards, and added a bunch of risk, since the Humble Defector could be killed before you get a chance to use it. Even if you have a permanent that can simply eliminate the Defector without costing you the second card, you are only netting a single card. Plenty of cards do something and offer "Draw a card" as an easy way to replace the card you just played. I think I want more from the Humble Defector than a single activation! We know the Humble Defector is an untrustworthy type, so perhaps we should put him under house arrest? Two cards that act as great ankle bracelets are Brooding Saurian and Homeward Path. Brooding Saurian does a quick check at the end of each player's turn to make sure no one has flown the coop. If he sees the Humble Defector out of the house, spending time with one of your opponents, he yanks him right back to your side of the battlefield. Homeward Path does pretty much the same thing, but you need to tap it to activate it. This means you can now draw those two extra cards on each of your turns, then get the Humble Defector back on your side of the board before any opponent can tap it to draw cards. Now we're talking! The most surefire way to guarantee the Defector never leaves is to kill him. Awfully hard for a dead Defector to defect. The problem with a dead Defector is that you don't get the card draw, and suddenly the Defector isn't as appealing. However, there is a card that makes a dead Defector read, "3, T: draw two cards." Mimic Vat is a wonderful thing! When the Humble Defector dies, exile it with the Mimic Vat. Now you can tap the Mimic Vat for three mana, put a Humble Defector token into play, activate it, draw two cards, give the token to an opponent, then watch the token die at the end of your turn. You can do this turn after turn with no risk of an opponent ever getting to draw the two cards you are getting. Keep in mind the Humble Defector can only draw the cards on your turn, and the tokens, even with haste, can only draw cards for you on your turn as well. Prophet of Kruphix is not going to help you in this situation. An alternative to Mimic Vat is the constant pain in everyone's side, Deadeye Navigator. Pairing the Navigator and the Humble Defector keeps the Defector from getting lost and wandering over to your opponents. Activate the exile ability, then tap the Defector to draw two cards. You draw the cards, the Defector moves to head to an opponent, and is then exiled, returning to the battlefield under your control. This move allows you to use the Defector as a blocker on opponents' turns if you wish, exiling him when it looks like he might die. The downside is you still only get to use the Humble Defector once on your turn. Once he returns from exile, he is like a new creature, and can't tap until the start of your next turn. If only you were running Mass Hysteria, then you could tap the Humble One to draw two cards, spend two mana to exile and return him to the battlefield, then tap him again, looping as often as you have the mana to exile and return him to the battlefield. Sometimes, you just have to go in and get your man before he reveals too much to the enemy. While cards like Control Magic and Act of Treason can do the job once, it is better to have an option that will let you do it again and again. Beguiler of Wills easily slips behind enemy lines to get the Humble Defector and can do it turn after turn. The Beguiler of Wills, with Mimic Vat backup, keep the Defector drawing cards for only you, while Perplexing Chimera confounds and stymies your opponents and Primeval Titan brings the game home. A final option for Humble Defector is to be chaotic and just let things happen. Red has a fondness for chaos and for decks that encourage swapping permanents and creating ridiculous board states. The Humble Defector can most certainly add to the insanity, slotting in with Chaos Warp and Confusion in the Ranks to create a game every anarchist could love!